Hello everyone! My name is Kimberly Taylor. I am a rising junior and a Psychology major (intending to add Computer Science). 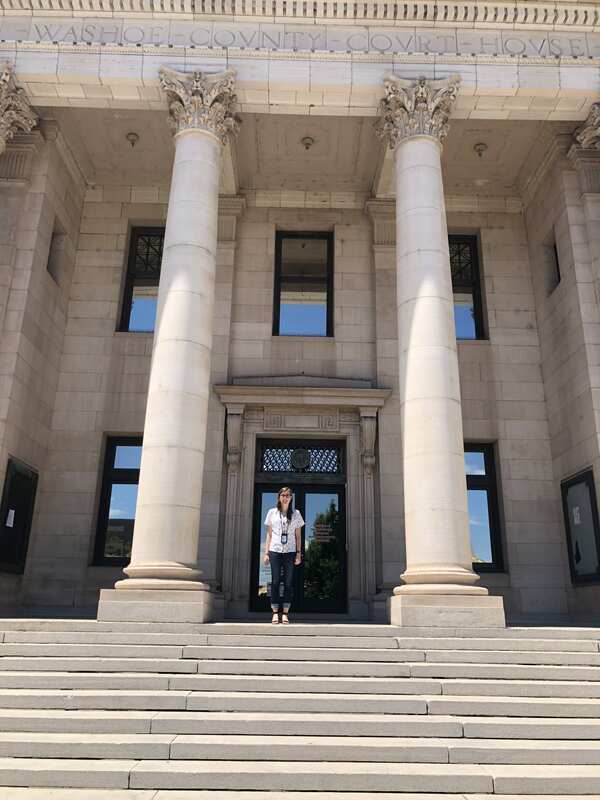 This summer, I am working as an intern at the Washoe County District Attorney’s Office (WCDAO) in Reno, Nevada. At this point in time, I am about half-way done with my internship and I have already learned so much. The WCDAO represents the state (the citizens of the county) in prosecuting crimes that happen in the district, as well as performing other legal functions that support the county government. The WCDAO has four divisions which include Civil, Criminal, Family Support, and Administration. Washoe County has over 440,000 citizens and the DA’s office employs 170 people which includes prosecutors, attorneys, legal support staff, investigators and victim advocates. Attorneys from the DA’s office negotiate with the public defenders by offering plea bargains in exchange for a guilty plea by the defendant. Course connection: This connects with the philosophy course, Punishment and Responsibility, that I took as a first year. In this class, one concept we discussed was how plea bargains fit into philosophical frameworks that explain how punishment and responsibility should be determined within our criminal justice system. Plea bargains decrease the punishment that someone might receive in exchange for claiming responsibility for a crime they are charged with. Does claiming responsibility for a crime decrease someone’s responsibility and therefore justify a lesser punishment? Attorneys represent the DA’s office in adult guardianship cases. Adult guardianship is when the state assumes legal authority to represent someone who can no longer represent themselves. Family members or friends can become legal guardians for someone, but when this is not possible the state appoints a public guardian to represent them. Observing criminal court proceedings. These cases encompass quite a range from murder to larceny to sexual assault cases. Through these observations I have learned so much, all of which I don’t have enough space to include here. I will touch briefly on the topic of jury selection since I see many connections between this and my study of psychology. I was able to observe the entirety of the jury selection process. A large group of potential jurors come to the courtroom and the judge and counsel (prosecutors and defense) are charged with finding 13 members of the jury that will be fair and impartial. This process takes a long time as each potential juror must be asked questions by the judge and counsel. The judge can dismiss someone if it is determined that they may not be able to be fair and impartial. Course Connection: In my Psychology of Law class we discussed implicit bias and whether or not people are really able to be fair and impartial. This system is obviously not perfect so I have wondered a lot about what could be done to make it better. Contributing to research projects that help the DA’s office to better serve the county. These projects have involved navigating the software that the DA’s office uses to store information about all the cases that come through the office. Course Connection: This connects to my CS classes because it connects with the way that data is collected and processed and how technology can help someone do their job more effectively. How could the software systems that the DA’s office uses be modified to more effectively serve those who use it? While I am not sure where my career will lead me, this internship has informed me about one path someone might take after getting a law degree. The work of attorneys at the DA’s office vary significantly from day to day, and I think this is something that is most exciting about the position. I have really enjoyed my internship so far, and I am looking forward to the rest of it. In the future, I want to continue to learn more about the criminal justice system both through classes and work experience.